In order to build a high performance home, builders have to embrace new technologies and techniques that may not actually be much different than what they're used to do doing. But the results can be greatly improved over traditional approaches. 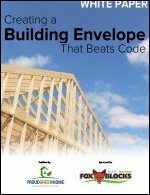 This white paper takes a look at some of the top things homebuilders should consider in choosing a wall system for the best building envelope.